Your Phantasy Star foes will feel mighty silly once you smack them in the face with a pizza. Pizza is many things. It's a delicious food that contains representatives from all the major food groups, for one. It's one of the most-commonly craved foods in the USA (right after chocolate), and it's used by the Teenage Mutant Ninja Turtles to power up after a long day fighting crime. But did you know that pizza is also a weapon? That is, it's a weapon in Phantasy Star Portable 2 Infinite, as per a cross-promotion with Pizza Hut in Japan. From now until March 28th, if you order a pizza from a Japanese Pizza Hut, your tasty pie will include a certificate for a tasty in-game weapon. This savory spear-class weapon does 50% fire damage, smells delicious when it's equipped by Level 1 characters, and looks hilarious when you're using it to beat your enemy over the head. 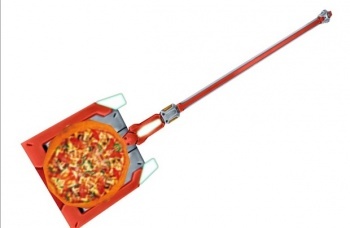 You can also purchase two other pizza-themed weapons from an in-game Pizza Hut shop, reports Siliconera - a Camebert Peel halberd and a Chicken Teriyaki spear. I'm getting hungry just thinking about it! It's worth noting that this is not the first time the Japanese branch of Pizza Hut has engaged in bizarre nerd-themed cross-promotions. It was the sponsor of Sunrise's 2006 high-school-hijinks-and-mecha-battles-in-an-Alternate-Universe anime Code Geass, in which it was the trademark favorite food of the enigmatic witch, C.C. She carried around a plush doll of the franchise's Japanese mascot Cheese-kun and everything, too. No, I'm being serious. Man, why can't American Pizza Hut be this entertaining and this nerdy? If they teamed up with Blizzard to put epic-level Pizza Hut trinkets in WoW, they'd make a delicious killing.